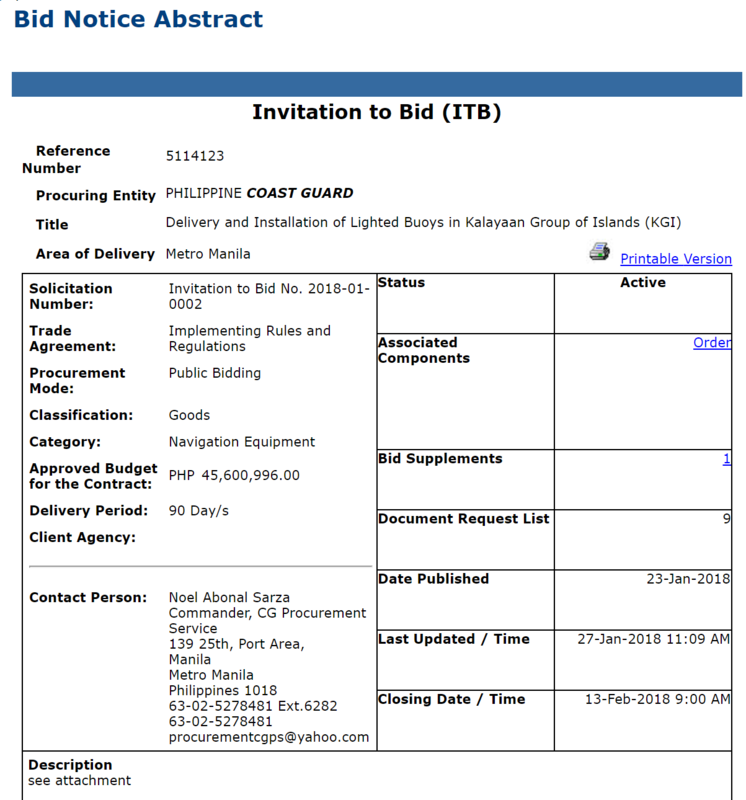 The Philippines hopes to complete the construction of a beaching ramp on Pagasa Island (Thitu Island) in the West Philippine Sea (South China Sea) by early 2018. The construction of a beaching ramp is the first stage of the upgrade of the facilities in the disputed island. It will allow ships to dock so that heavy construction materials could be delivered. Defense spokesperson Arsenio Andolong said on Tuesday that the monsoon rains have hampered the construction of the ramp. “While its construction is ongoing albeit intermittently depending on good weather, we expect its completion by early 2018,” he told reporters. When the beaching ramp is constructed, the government can further improve the rest of the facilities in the island, including the repair of the runway. Defense Secretary Delfin Lorenzana says he is confident China will not protest the repairs, citing improved relations with the military superpower. MANILA, Philippines – The Philippines said it is again gearing to start repairs on its dilapidated runway on Pag-asa Island in the West Philippine Sea (South China Sea), a project that was already funded by the previous Aquino administration but which has continued to face delays. need pa talaga mag press release? napansin ko pag nag press release sila, nag alburuto ang kabila at nag make representations na wag na tuloy..
gawin na lang without any much fanfare.. Most of what's already been done has actually been done secretly. That means . . . information about these improvements are fair game. This how the garrison NOW looks on Google Maps. This is how it looked during the previous administration. Contrast this with the condition of the ship today. Details of what else has been done within the vessel are not open to the public. Metro Manila (CNN Philippines, May 27) — The Palace defends the construction and repairs on Pag-asa island reported by a U.S.-based think tank. Presidential Spokesperson Harry Roque said these repairs fall within the Philippines' mandate. "Repair of port facilities in Pag-asa is consistent with our national sovereignty and jurisdiction," Roque said in a statement Saturday. 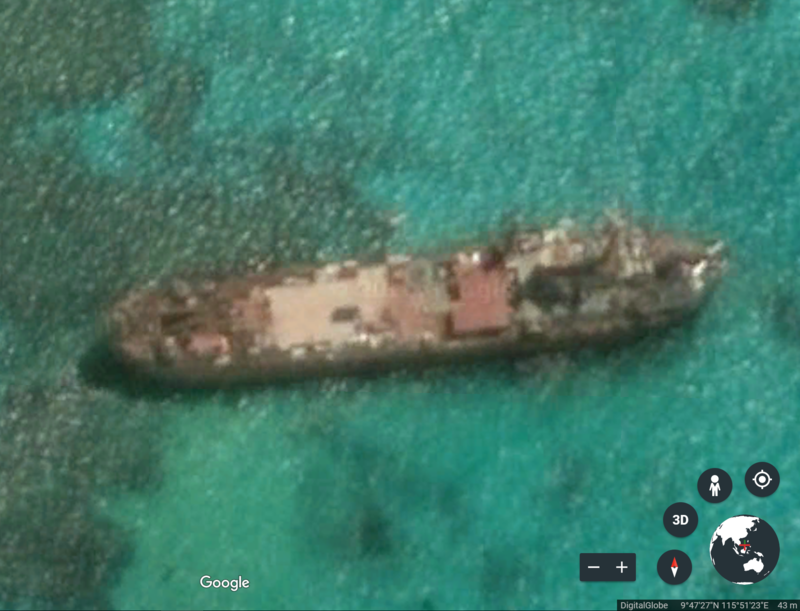 Satellite photos from a the Asia Maritime Transparency Initiative (AMTI) showed the Philippines is doing its own repairs on occupied islands in the Spratlys. The Spratlys, an island group west of Palawan, is subject to overlapping claims of countries like China, Malaysia, Vietnam and the Philippines. China claims almost the entire South China Sea where an estimated $3 trillion worth of sea-borne goods pass every year. 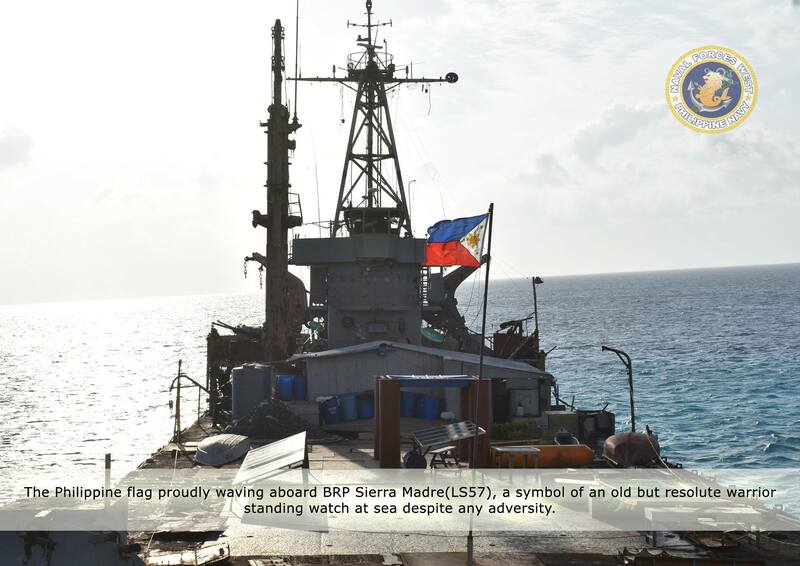 The country has nine outposts in the Spratlys, as set in its exclusive economic zone (EEZ), with Pag-asa being the largest of the nine features. The AMTI on Saturday reported that the Philippines has been repairing the runways on Pag-asa Island (international name: Thitu Island). "Thitu sits just over 12 nautical miles from China's air and naval base at Subi Reef, and was the site of a tense standoff with a Chinese flotilla last August," the AMTI said. AMTI satellite photos from May 17 showed two dredging vessels found west of Pag-asa island, fixing the collapsed airplane runway. "Loose sediment from dredging can be seen in the water around the two barges and freshly-deposited sand is visible along the northern edge of the runway," the AMTI said. While the think tank noted that dredgers like the ones used by the Philippines and Vietnam can still harm marine environment, it is still less harmful than the suction cutter dredging method used by China. The dredging, it added, is needed to allow larger vessels carrying heavy machinery and construction materials to approach the island. The AMTI also noted seven new buildings constructed on Pag-asa, and that the basketball court has received a fresh coat of paint. Pag-asa is home to at least a hundred Filipinos and a small military garrison. Satellite photos also featured new construction in other Philippine occupied features in the Spratlys, namely Rizal Reef (international name: Commodore reef), Lawak Island (international name: Nanshan island) and Panata Island (international name: Loaita cay) within the year. A new shelter has been built on Rizal Reef and Panata Island, while Lawak Island has a new helipad. There have been no visible repairs or upgrades in the five remaining Philippine-occupied features in the disputed island region. When the truth is stranger than fiction, and most commentators have been out of the loop. The truth is finally out. Construction has been going on for the better part of a year... preparations for this move, happened the previous year. ...The AMTI on Saturday reported that the Philippines has been repairing the runways on Pag-asa Island (international name: Thitu Island). ...Satellite photos also featured new construction in other Philippine occupied features in the Spratlys, namely Rizal Reef (international name: Commodore reef), Lawak Island (international name: Nanshan island) and Panata Island (international name: Loaita cay) within the year. MANILA, Philippines — The government is building five lighthouses in South China Sea features occupied by the Philippines to ensure the safety of transiting ships and to improve the living conditions of Filipinos in the area, an official said Wednesday. National Security Adviser Hermogenes Esperon Jr. said lighthouses are being constructed in Pag-asa, Parola, Likas, Patag and Kota, islets that are part of the Spratly Islands. "We are upgrading facilities for the comfort of our people," Esperon said during the Kapihan sa Manila Bay forum in Manila. Convention on the Law of the Sea) to provide navigational safety for all international vessels transiting the West Philippine Sea," he added. Esperon said the construction of lighthouses, which costs about P10 million, is part of the government's effort to upgrade Philippine-claimed features in the West Philippine Sea. The government is also upgrading port and airstrip facilities in Pag-asa island, the largest of the nine features controlled by the Philippines in the Spratly Islands. of Pag-asa," the national security adviser said. "It is but natural (to carry out upgrades) because we have a fishing community there," he added. 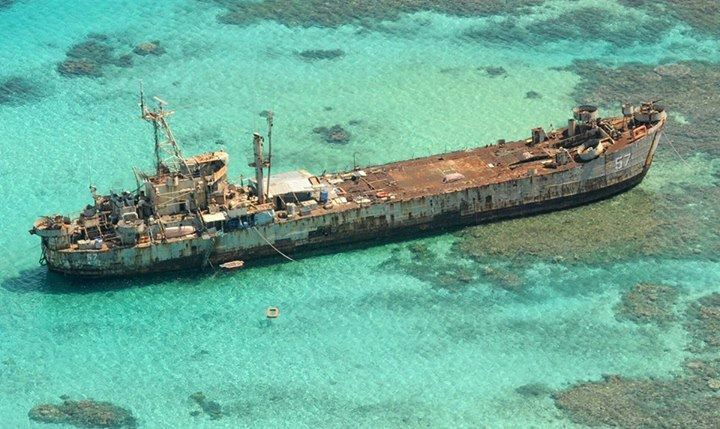 Esperon said the upgrade and repair of the runway on Pag-asa, which China calls Thitu island, would allow the government to send supplies to troops stationed in the area. China claims historic rights over about 90 percent of the South China Sea including Spratly Islands while the Philippines, Vietnam, Malaysia, Brunei and Taiwan have overlapping claims. While China has been aggressively building new structures, including military facilities, in disputed areas, planned improvements in Philippine-held features were delayed to avoid tensions. The key of these improvements is secrecy. Keep out the media and dont feed them even tiny bit of info. Make this repairs and improvement silent. and make an effort to distract the media away from it. Then AFP can make a full blown improvements and add more structures with speed. Kudos to Navy and Air Force. Looks like this project that was announced last January actually went forward. Progress on the construction of a landing dock at Pagasa Island. Defense Secretary Delfin Lorenzana Thursday said the landing dock in Pagasa Island, Palawan is 40 percent repaired. Lorenzana made the remark during an ambush interview during the Air Force Symposium 2018 held at the Commissioned Officers Camp Aguinaldo, Quezon City. “So far we are still repairing the landing dock of our LSD or Dock landing ship. Without that we cannot bring materials,” Lorenzana told reporters. “It’s going along. They said last month the landing dock is 40 percent finish. It started construction late last year,” he said. Lorenzana, however, said that construction might be interrupted especially in July, August, September, and October due to the rainy season. “The sea is very rough during those months. It will depend if the contractors will have a good timing of bringing in the materials then we can start,” he said. When asked if the repair in Pagasa has experienced any form of harassment from the Chinese, Lorenzana said there was none. “No, no. There are no, there were no harassment. In fact, we already brought a crane there. The beaching ramp is almost finished. Once that is finished we can bring in more construction materials, the gravel, the sand, and the cement because there are no sources there, and these materials are coming still from the mainland,” he said. When sought to comment about the harassment supposedly of a Navy boat during a resupply in Ayungin Shoal last May 11, 2018. “That is a very isolated incident and I think that has been already resolved between the Philippines and China,” he said. He also denied that the country has already lost Sandy Cay, Lorenzana said nothing is lost there “Because nobody has occupied the Sandy Cay, nobody”. Lorenzana earlier said that government has allocated some P1.6 billion to improve facilities on Pagasa (Thitu) Island, part of the Kalayaan Group of Islands west of Southern Palawan. Defense Secretary Delfin Lorenzana said on Wednesday that the beaching ramp at Pagasa Island (Thitu), the biggest Philippine-claimed outpost in the Spratly Islands, is 40 percent complete. The beaching ramp was originally targeted to be finished by yearend so the repair of Rancudo Airfield will begin in 2019.